So, I get on the Twitters, and I say, "Hey, I see that Lord of the Rings Online is free to play. Anybody play/played it? Thoughts? " And before too long, the responses start flitting in. Little moths caught in waiting hands. And that's just after the first ten minutes. Not long after, I'm forced to ask, "Yes, but is it worth free?" The key words up there? "From people I trust." Word of mouth is a powerful thing. It's immeasurable. It's unquantifiable. And it's bigger than ever. Consider that, once upon a time, word of mouth traveled in tight circles, moving in tight whorls of breath and voice - little dust devils dancing this way, and that. The guy in the next cubicle tells you about a movie he saw over the weekend, wants you to know that it was a real dog, a crap-shellacked snoozefest, a total cinematic abortion. Or a buddy of yours says, "Dude. L4D. Tonight. Xbox. Zombies. You in?" Or maybe your mother "heard" about this great new television show. Lost. Or Desperate Housewives. Or Burn Notice. Or Lost And Desperately Burned Housewives. Then your sister tells you about this new indie flick. Or an iPhone game. Or a new book you should read. Word of mouth was, what? Maybe ten people deep? 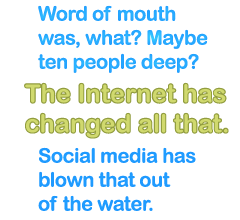 Sure, each circle of trust crossed paths with another circle of trust (and with another, and with another, until it becomes a series of magic rings linking infinitely), but for the most part, word of mouth was an intensely local affair. Intimate, in a way. Friend to friend. Face to face. The Internet has changed all that. Social media has blown that out of the water. Are reviews even necessary anymore?